Kerrie's winning entry in the Last Chance Pick 10! yielded only two correct picks but it was one more than any one else! She won the stamp sets Darling Dots and Sweet Little Sentiments. Congratulations to Kerrie! Thanks to everyone who entered! You all will receive $5 off your first order of $50 or more from the new 2009-2010 Idea Book & Catalog. What a great way to start a new catalog! Let's play again next year! This was a lot of fun! As for my picks, I didn't do so well. Out of the 54 sets I chose, only 21 of them were actually on the Last Chance list. Of course, there were 99 total on the list. So, you do the math...I didn't do so well! But, I had fun! I realized that what I thought should go certainly isn't what Stampin' Up! thinks. You can check out the Last Chance list by clicking HERE! And HERE for the Last Chance Decor Elements list. This link will take you directly to the customer website Last Chance items. Some items are as much as 50% off. Check it out. Accessories are available only while supplies last so don't wait to order. I am going to miss Heartfelt Thanks! This was one of the first sets I purchased and it is an all-time favorite of mine. So, here are just a few of the cards I've made using this set. For the above card, I applied Watercolor Wonder Crayons directly to the stamp, misted with water and stamped onto paper. I also used the Watercolor Joy wheel up the side. 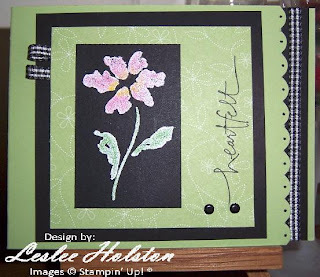 For this one, I embossed the flower in white embossing powder on Basic Black card stock. 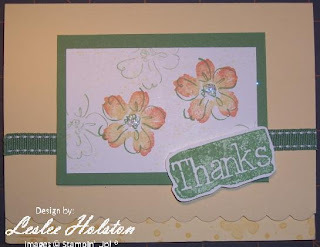 I then colored over the embossing using my blender pen and Stampin' Pastels. This is a personal favorite card! This one, I mass produced for a sideline swap. I used the rock-n-roll technique on the solid flower. 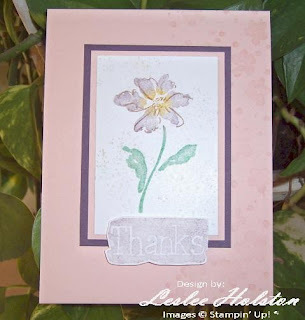 Then stamped the outline flower repeatedly (stamping off) to create a soft background. I placed a mini glue dot in the flower center and covered it with glitter. An easy card to do. Thanks for stopping by today. Sorry I didn't post sooner. I was having computer issues. By the time the boys got home from school, I had all but given up. Anyway, I think the kinks are worked out now (keeping fingers crossed). Let me know what you think about the Last Chance list. Agree...disagree? Just can't wait for the new catty now?